One of the things that’s interesting about Homeland is the way it’s using time. By far the most common way for a TV show to use time is to have events in the characters’ lives happen at roughly the same rate as events in our own lives. One week for the characters is roughly one week for us and so on and so forth. After that, probably the most common timescale is the soap opera timescale, where things happen right on top of each other, so the total amount of time in which the show takes place is very short, often less than a year. (Lost and Breaking Bad would fit into this paradigm.) There may be time skips between seasons, but the events themselves take place over a very short period of time, cumulatively. 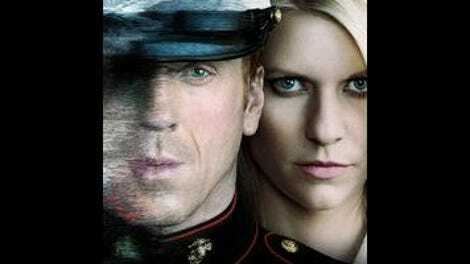 But then we have the way Homeland uses time, which is unusual. Indeed, I think only Mad Men really uses time in the same way as this show. Namely, as much time passes between episodes as the writers need to get to the next part of the story. Three weeks has passed between last week’s episode and this one, and in that time, not much has happened. Brody has gotten better at being a spokesman. Carrie has seen her FISA warrant run out with absolutely nothing in the way of actionable intelligence. The CIA has tracked down what happened to Lynne’s necklace but still has to figure out a way to track down the person who took the cash. And the Brody marriage has crumbled even more, especially since it sure seems like Brody’s figured out that his wife and Mike were having an affair while he was gone. In many ways, this episode set up a set of new story arcs for the series after the first three episodes neatly closed off many of the story threads that had been set up within them. We don’t get any flashbacks to Brody’s time in captivity—our flashbacks this week go back to before he left for Afghanistan—and our scenes of Carrie conducting surveillance are also ended. But we do get some intriguing new hints about David, who finally gets some character definition beyond “the boss.” In one scene, he’s telling Carrie’s new partner to figure out just what she’s up to beyond her official work. (He finds it suspicious that she mentioned Abu Nazir out of nowhere and then he popped up on the radar—thanks to work one of her assets performed—a few days later.) In another, he’s inviting Carrie to stay and have a drink, and the two go over their messed-up relationship. It’s a nice, easygoing scene that’s played well by Claire Danes and David Harewood, and it gives us a nice sense of how these two could have had a fling at one time. It’s good to have them set the personal enmity aside, I think, since now David’s suspicions of her can stem entirely from the strange ways Carrie acts. We’ve also got a series of wonderful little scenes among the Brody family. In particular, I loved the scene where Jessica went into Dana’s bedroom, obviously on the edge of tears, because she feared that Brody, who kept dropping leading little hints, had found out about her thing with Mike. The guilt’s been eating away at her all this time, and she’s wishing she had just told him when he first came home, even though at the time, that was the last thing on her mind. (It’s always the last thing on your mind that you wish you’d done later on, isn’t it?) Dana, assuring her mom she didn’t say anything, mostly seems uncomfortable with the whole thing but finally asks if Jess is all right. It’s fine, Jess says, hesitant to flip the parent-child relationship that much and bring her daughter too far into her own issues. But it’s not; the Brody family keeps trying to return to an idyllic past—when Jess cavorted in lingerie in the back of a car for her husband and he held her so long before leaving for the war that Mike busted his balls about it—but that past has been chewed up and spit out both by eight years and by the way Jessica can never understand what Brody went through. And that, ultimately, rolls back around to the episode’s major theme and its main political point: our treatment of returning veterans. Jessica can’t stand to see her husband constantly on edge. (At one point, he shoots an eight-point buck that’s been trampling her tulips. In the middle of a house party.) She asks him to go to seek help, and he finally agrees, heading for the veteran’s support group meeting where he meets Carrie. But notice how muted, how underfunded, this whole situation is, particularly when compared to the scene where Brody sends the troops off to war or the scene where the aide to the Vice President tries to get him involved in a greater PR capacity. Those returning from war—in any era—are at best unable to be understood by civilians and at worst tossed aside by society. In his conversation with Carrie, Brody asks why it’s so hard to talk about the war with anyone who wasn’t there, but she suggests a better question: Why is it so hard to talk about anything at all with anyone who wasn’t there? And as much as we wonder just how much truth there is to what she’s saying (since this is, after all, another one of her strange gambits), Brody’s turmoil over what happened begins to peek through even more. The veterans haven’t been completely forgotten—they still have some recovery services—but as a society, we’re always far more eager to send kids off to war than welcome them home. When they come home, it’s impossible to relate to them, so we put them in the “hero” box and assume that’s good enough. But it rarely is. Nice touch: Carrie finally gets to be inside the Brody household as she and her team tear down the cameras and microphones. She, of course, chances a look inside the garage. While looking for something definitive that would prove he was guilty, she picks up his prayer rug and thinks nothing of it. Now, naturally, it looks just like a rug, so she’d do that, but it’s a nice look at how Carrie’s always unwilling to put the smaller pieces together when there’s a bigger bombshell she’s just waiting for. I’m not sure what’s gained by occasional drop-ins on our new terrorist threat—the couple living in the house we saw at the end of the last episode—but Carrie and her partner tail the male half to the house, only to have him warned off by the American flag his wife puts in the window. Somebody calls her—presumably a mole within the CIA (and my remembrance of 24 has me groaning at the thought of a “who’s the mole” subplot)—to tip her off, but the ruse works, and the CIA is no longer investigating her husband. This was a nice little sequence, but the other scenes with the couple were merely there to be vaguely ominous. Poor Chris. Gets his dad back but loses his new deer friend. The soap flakes didn’t work!